Sorry, your browser does not support modern audio playback, however, you can download the audio for Global Podcast: The Laboratory for Global Performance and Politics. 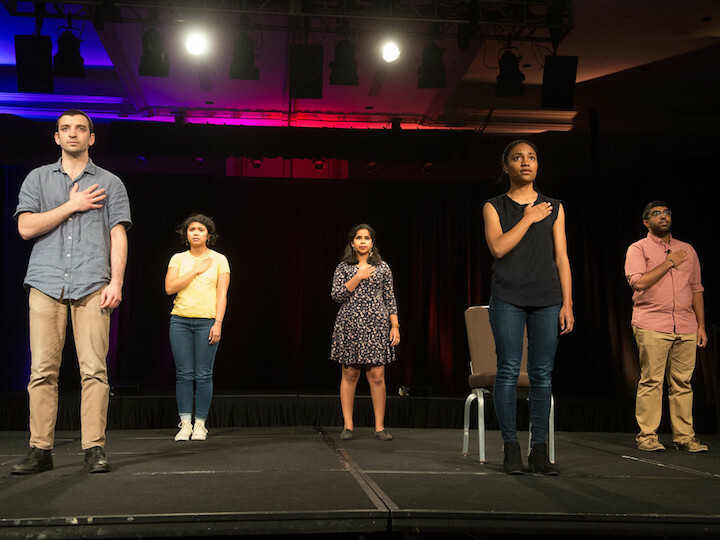 Students stand with their hands over their hearts while performing "I Pledge Allegiance"
Based in the Walsh School of Foreign Service (SFS), The Lab harnesses the power of performance to humanize global politics. Co-directed by Ambassador Cynthia Schneider, a distinguished professor in the practice of diplomacy in the SFS, and Derek Goldman, a professor in the Department of Performing Arts, the Lab brings international performances to Georgetown’s campus and hosts guest artists from around the world. It also sponsors a Lab Fellows Program, an SFS Centennial Lab course on Politics and Performance, a Think Tank of thought-leaders working in the arts and global politics, and a Campus Cohort of interdisciplinary Georgetown faculty. Listen to the podcast to learn more about The Lab's mission and origins, and to hear from Goldman, Schneider, and Lab Fellows Caitlin Nasema Cassidy (C'11) and Velani Dibba (SFS'17) about their experiences working at the intersection of performance and politics. Georgetown’s Global Podcast follows faculty and students as they pursue exciting global research in medicine, law, business, and the social and physical sciences. It is produced by members of the Global Communications Group’s multimedia team. Read the full transcript below. Cynthia Schneider: What is the impact of policies on the people? What is it that the people in that situation–what are their dreams and hopes? Not what would benefit Country AB, but what about those people? What would benefit them? I have the radical idea that rather than thinking abstractly what would benefit us, actually, if you enact your foreign policy in a way that benefits people on the ground in their own terms, they are going to look at you positively and be a strong ally. It's not rocket science. But to do that, you have to know what their terms are and what their lives are and what their struggles are, and what their hopes and dreams are, and what their capacities are. That's what performance and theater gives you insight into. Host: Ambassador Cynthia Schneider is a distinguished professor in the practice of diplomacy in the School of Foreign Service and a co-director of The Laboratory for Global Performance and Politics. As a former ambassador, she has experienced the connection between culture and diplomacy firsthand. I’m Andrew Walker, a member of the Office of the Vice President for Global Engagement, and in this episode of the Global Georgetown Podcast, we’ll talk with Professor Schneider, Professor Derek Goldman, and other members of The Laboratory for Global Performance and Politics about their mission to humanize global politics. Derek Goldman is a professor in the Department of Performing Arts and co-director of The Lab. He is an award-winning stage director, playwright, producer, and scholar whose work has been performed Off-Broadway and at major regional theaters around the country and the world. So what got him interested in combining performance and politics at Georgetown? Derek Goldman: I had the privilege of being the artistic director of the Davis Performing Arts Center over a period of about 10 years, and was just so struck from when I first arrived at Georgetown that there was a really singular type of student here. Every year, there was a group of students already really working at this intersection of what we might broadly call theater and politics, art and international relations. We’re interested in not only how to do the work well artistically, but what the work does in and for the world, how the work is understood in the world. Host: Schneider and Goldman both encouraged students to explore this intersection of theater and politics, and unintentionally at first, often found that their work overlapped. Schneider: Well, I was teaching courses in diplomacy and culture, and they always involved asking students to attend performances at Georgetown and in Washington, D.C. as a way for them to understand how performance that engages foreign policy issues could really shake them out of a kind of policy framework into looking at things in a different way and give them incredible access to what people in those places, in those situations were thinking. I found myself assigning them to go see performances that Derek was bringing to Georgetown and I didn't know him yet. I didn't even know it was him who was doing it. I kept saying, "Oh, my gosh, the Belarus Free Theater is here, you have to go see that." So I became aware of what he was doing that way, and I think colleagues, various people said, "You two have to meet each other." So we did. Goldman: It was really the kind of momentum and energy of student interest and passion that helped to create the trajectory that would eventually lead us to kind of take stock of things and say, this is more than just a set of projects and initiatives, but that there's something larger here going on. Host: Driven by this sense of unique student passion, Schneider and Goldman hosted a three-day convening of thought leaders from the arts and politics in 2012. Out of this conference came the name and mission of The Lab, as well as excitement about Georgetown’s unique ability to take on this work. Schneider: There was a real sense that it would be fantastic if this happened at Georgetown, because of the multidisciplinary nature of what we were trying to do, because of Georgetown's strength in international affairs, and because of Georgetown's sort of core values and sense of doing something good in the world. Then of course, being in Washington, D.C., that you have the decision makers and the policy makers here, their sense that this could really have an impact. Host: Since its first convening in 2012, The Lab has worked with Georgetown students, faculty, and alumni to advance its mission to humanize global politics through the power of performance—on campus, in D.C., and globally. Caitlin Cassidy worked with The Lab during its earliest stages, which helped her meaningfully connect her passions for the arts and social justice. Cassidy, who graduated from the College in 2011, is currently a theater artist based in New York City who works largely with Middle Eastern communities both in the United States and abroad. Caitlin Nasema Cassidy: I arrived at Georgetown pre-lab and I arrived, declared an Arabic and government major thinking that I wanted to pursue a career in the foreign service. But having grown up in the theater also wasn't quite ready to let go of that. I think at the time ... I believed my interests were divided. I was not able to envision a meaningful integration of the arts and politics. It was like Broadway or the foreign service, one or the other, and I think when I enrolled in Georgetown I sort of believed I had chosen the latter and resolved to pursue the arts recreationally. And then I met Derek Goldman and Maya Roth and a number of folks who were working in the program for performing arts, and they really altered the course of my life in teaching me not only how possible but how vital the integration of arts and politics is. And that is now what I do. So when The Lab emerged it was really, really exciting for me to see that this organization was being formalized for that purpose, for integrating various art forms and concern about justice in the world and empathy. Host: Velani Dibba, a 2017 alumna of the School of Foreign Service, felt a similar longing to combine her passions for theater and international relations. She found that The Lab’s placement in the School of Foreign Service added a flexibility to how she studied international politics, which helped lead her to the Master of Fine Arts Directing Program at Columbia University. Velani Dibba: Georgetown is uniquely suited for this very specific goal of looking at culture and arts and politics. What's great about Georgetown is that some schools might be more inclined to pigeonhole you into a single way of approaching international relations, the School Foreign Service is really keen on trying to find out what aspect of international relations you're interested in. Whether it's do you want to look at it from the economics perspective or the legal perspective or the socioeconomic perspective of international relations and culture. How can we allow you to study that best? What I found when I was a student in School Foreign Service, I didn't have to go straight into treaties and being in the United Nations, and things like that. I could look at culture and art and all the things that I loved about culture while still moving towards a degree in international relations. That gave me a very specific perspective on how the arts influence politics in a way that I don't know I would've been able to do had I been in a lot of other international relations programs that I was looking at. Host: Cassidy and Dibba are both part of the Lab Fellows program. As Lab Fellows, they participate in a virtual global residency alongside promising professionals from around the world. Fellows convene to discuss arts and theater in a global context during Zoom calls every six weeks, with an annual in-person convening that takes place every summer. The inaugural cohort of fellows met in person for the first time last August at the world-famous Edinburgh International Festival. Dibba: I think one of my favorite things about the Lab Fellowship is the fact that we all are active artists. We're all doing very different things, which I think is also really interesting because when we come together and we talk about theater we have so many different perspectives. Yet, we're able to synthesize and talk cohesively about art in general in a way that I wasn't aware was possible. Cassidy: In this highly polarized time of boundary drawing, the community of the Lab Fellows reminds me, on a sort of daily basis, that we're all human, that making the art is possible and meaningful. If I'm ever having moments in which I'm wondering, and I definitely have them, "What am I doing? Should I be in politics and not in art?" I come to this community and I'm reminded that theater and the arts in general are such an extraordinarily powerful tool for real, lasting, positive social change. Host: The Lab Fellows Program is just one way that The Lab works to humanize global politics. Goldman and Schneider co-teach an SFS Centennial Lab on Politics and Performance, during which students travel to Cambodia to experience firsthand how the arts play a role in recovery from the 1970s genocide. The Lab also connects thought-leaders working in the arts and global politics through its Think Tank and Campus Cohort of interdisciplinary Georgetown faculty. Primarily, The Lab brings international performances to Georgetown’s campus and hosts guest artists from around the world. Goldman: The piece they developed, "I Pledge Allegiance", against the backdrop of the kind of very polarizing last year of life in America, deals with their experiences as mostly first-generation and immigrant students of engaging the sort of politics, not only the politics of kind of immigration and belonging, but the trajectories of their own family stories. Like what citizenship has meant for them and for their parents and grandparents, in some cases. Dibba: "I Pledge Allegiance" is about the paradox of the American identity. Different people consider themselves American depending on different circumstances. Other people might consider you to be American or not depending on your circumstances. We sort of wanted to track this weird phenomenon that is American identity. We started trying to think of scenarios in which American identity was challenged. We had everything from first date, the sort of awkward, "Where are you from?" questions, a TSA interrogation because this is right around the time of the Muslim ban. That was hot on our minds. Host: Dibba performed the piece alongside Lab Fellow Devika Ranjan, recent graduates Christina Ibarra and Ben Lillian, and rising senior Aly Panjwani. Through performing for an international audience in Spain, the students learned the strengths of performance as a medium for intercultural understanding. Dibba: When we showed this piece, we were showing it to people who came from a variety of different language backgrounds. Some people who barely spoke English. Some people who didn't speak English at all. One of the really cool things about performance is that if you do it a certain way, people are able to follow the plot without necessarily understanding everything exactly that's happening or not necessarily understanding all the words. The “I Pledge Allegiance" performance has a lot of symbolic gestures. It's obviously centered around the "Pledge of Allegiance,” so putting your hand over your heart and then looking at something and saying something in unison, regardless of what background you come from, universally signals an oath to something. Things like that help our audience track the performance. Host: Following the success of the performance in Spain, “I Pledge Allegiance” was performed on Georgetown’s campus as part of the Lannan Symposium, at John Carroll Weekend in Seattle, Washington, and at the Theatre Communications Group National Conference in Saint Louis, Missouri. The performance was also invited to be a centerpiece of the 2018 Al-Bugaa Festival in Sudan. Goldman: The response was really extraordinary. It was really seismic from their peers and colleagues from all over the world. I think it flipped on its head a lot of people's perception of what being an American means right now. We're continuing that work, because the nature of the work feels like it's not a piece that finishes. Dibba: My hope is that an international audience gets that Americans are as confused by their own identity as the rest of the world might be. Yes, it's supposed to be an expression of American identity for Americans. It's also supposed to shine a light on a perception of the American identity that other countries may not have seen yet. Host: Students like those involved in “I Pledge Allegiance” build lifelong skills and relationships through their work with The Lab. Alumni like Dibba and Cassidy have combined their Georgetown educations with more schooling and careers in the arts, while others have brought The Lab’s lessons into business and government roles. Cassidy: Had I not gone to Georgetown and studied both the arts and other things there is no way that I would be able to think about the arts with a sort of panoptic view that I do. I'm so concerned about the business side and the HR side and the global political context. And I'm so eager to know what other people are doing outside of the arts and I'm so eager for intersectional conversation and interdisciplinary process. And I am certain that none of that would've happened without Georgetown. Schneider: When we had the Freedom Theatre from Jenin Refugee Camp here performing The Island, the great anti-apartheid play, in a Palestinian/Israel context, performed by two young actors, who were basically the same age as the students. That, for my students, was like, "Wow, these people are like us, and how extraordinary their lives are, compared to mine, how different. And yet, I feel a connection." Like a year and a half later, I was doing something at the State Department, I literally bumped into a former student in the bathroom. She said, "Oh, my gosh, Professor Schneider, I joined the State Department because of that encounter with the Freedom Theatre." Host: Knowing the impact that The Lab has had on the students and artists involved in its work, Schneider and Goldman are excited to see the Lab’s work grow. They have hopes for a designated space to perform and more capacity to collaborate with artists and theaters abroad. Above all, they hope to continue to inspire the next generation of socially-engaged artists and demonstrate the difference that performance can make to global politics. Goldman: Performance is action, is a doing. It's not just letting off steam, it's not just existing in a kind of, the way that sometimes societally we've cordoned off the arts as sort of something lesser. It's really all over the world. It is a catalyst for change, and an understanding of it, a rigorous appreciation of it, and some skills around enabling it, really can be difference makers. Schneider: I discovered the power of culture and diplomacy in real life. I saw how powerful it was. I hosted performances. I hosted film screenings, I organized discussions, engaged creative activity, and I saw how powerful this was. I also saw that the State Department, in my view, doesn't take this as seriously as it might. There was still this gap, of you know, "It's great what you're doing, it's really important. But now we're going to go do the serious stuff." I really want to bridge that gap. I want people to see that arts and culture is the serious stuff. Host: To learn more about the Laboratory for Global Performance and Politics, visit globallab.georgetown.edu. Thanks for listening to the Global Georgetown Podcast. Once again, I’m Andrew Walker, a member of the Office of the Vice President for Global Engagement. This episode was produced by members of Georgetown’s Global Communications Group multimedia team. Join us again soon, as we follow Georgetown faculty and students and the exciting global research they are doing in medicine, law, business, and the social and physical sciences.